Once a year, Atlanta Motor Speedway is the bustling center of the Monster Energy NASCAR Cup Series world, filled with hundreds of thousands of fans from all over the country. But the rest of the year, this premier racing facility is open to the public for speedway tours and a behind-the-scenes look at one of the south's finest entertainment complexes. Official track tours include a brief track history, a visit to Petty Garden, a tour of an Atlanta Motor Speedway suite, a sneak peek at the garages and Victory Lane, and three laps in the Speedway van around the same 1.54-mile track that stars like Jimmie Johnson and Kyle Busch race on. 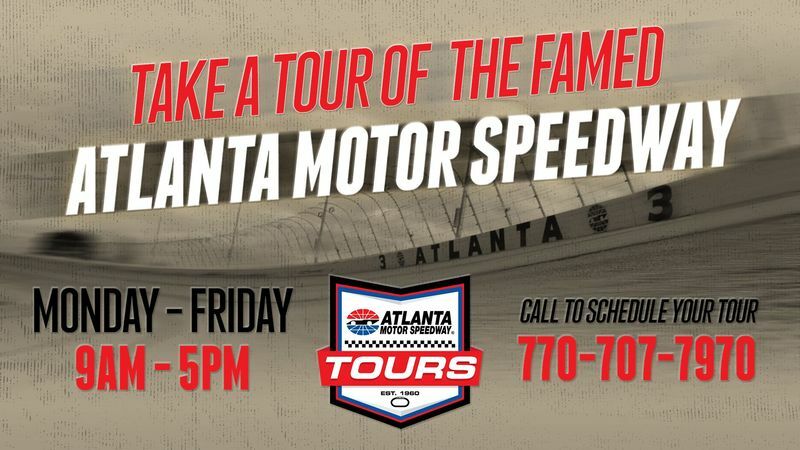 Please call (770) 707-7970 in advance to schedule your track tour, regardless of the size of your group. For groups of 12 or more guests, a 10 percent discount is available. Track tours will be given at 10 a.m., 11 a.m., 1 p.m., 2 p.m. and 3 p.m. and 4 p.m. Monday through Friday. Track Tours and rides are depending upon track availability. Please call 770-707-7970 to ensure availability of track tours.